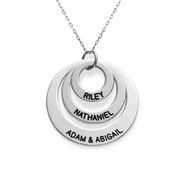 If you're shopping for Jewelry for Moms, our three disc necklace is the perfect gift. 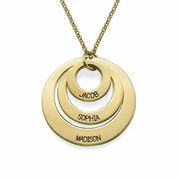 Engrave three or more names on the rings of this rose gold plated piece to make it extra special. The rings hang elegantly from a rose gold plated Rollo chain. 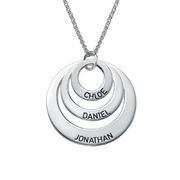 This item is also available in sterling silver, gold plated, Multi-tone, Yellow Gold and White Gold. 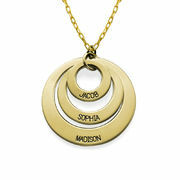 Yes, the jewelry arrives as shown and all the letters are capitalized. Measurements: big disc: 32.16mmx32.16mm / 1.26"x1.26"
Beautiful! My wife loved it! Well made. Nice item.